Corporations acted as cartels and filled our country with opioids. Connecting that to the epidemic of overdose deaths is not fake news. Conservatives, of all people, should learn from the past. Thus, I was disappointed by Peter Pischke’s recent Federalist article, which ignored the role of pharmaceutical companies and prescription drugs in creating the current epidemic of opioid abuse and overdoses. Pischke is correct that current “opioid-related deaths are driven mainly by heroin and black-market fentanyl,” and he may have a point in bemoaning tough prescription opioid restrictions that he believes are harming responsible patients with legitimate chronic pain. But the connection between prescription opioids and the crisis of overdoses and deaths is not, as he suggests, fake news. Rather, the conventional wisdom regarding this connection is a result of the role pharmaceutical companies played in creating the opioid crisis. Indeed, on the same day Pischke’s article appeared, it was reported that Purdue Pharma, maker of OxyContin, had reached a settlement with the state of Oklahoma for more than $200 million. Such settlements are belated justice for the corporate misconduct that helped foster an overdose epidemic that is killing tens of thousands of Americans per year. Although the opioid crisis has evolved to include heroin and fentanyl, it began with a flood of prescription painkillers pushed by opioid makers. As Christopher Caldwell recounted in First Things, “the whole pharmaceutical industry was engaged in a lobbying and public relations effort to restore opioids to the average middle-class family’s pharmacopeia, where they had not been found since before World War I.” The taboos against casual opioid use were broken down as doctors were encouraged to aggressively medicate pain, and patients became accustomed to receiving opioids almost on demand. The Centers for Disease Control and Prevention (CDC) reports that more than 17 percent of Americans received an opioid prescription in 2017, and that is after significant declines in overall prescriptions, especially high-dosage ones. Naturally, some patients became addicts. Even if we accept the 1 to 2 percent abuse rate that Pischke offers, the total number of prescription opioid abusers is horrifying. But it is worse than that, for as Caldwell put it, the real catastrophe was “that a broad regulatory and cultural shift released a massive quantity of addictive drugs into the public at large.” Opioids were mainstream again—this time less scary (pills instead of needles, at least at first) and easier to score. They were everywhere, and they were supposedly safe. Multiple states are accusing the manufacturers of deliberately lying about their addictive potential. They quickly became part of the general drug culture, and pharmaceutical companies, wholesalers, drugstores, and crooked doctors spent years getting rich pushing pills before the law started to catch up. Now lawsuits, fines, settlements, and even criminal charges have hit every part of the prescription opioid network, from major pharmaceutical companies like Purdue Pharma and retailers like CVS and Walgreens down to local drugstores that became pill mills. The numbers tell the sordid stories, town by town and dealer by dealer. Consider West Virginia, which has been especially hard-hit. One headline reads, “Drug Distributors Shipped 20.8 Million Painkillers To West Virginia Town Of 3,000”; another article reportsthat “From December 2002 to January 2010, more than 335,130 prescriptions for painkillers were issued under the name of Dr. Katherine Hoover at the West Virginia clinic where she worked.” Corporations acted as cartels and filled our country with opioids. Connecting that to the epidemic of overdose deaths is not fake news. The business of prescription opioids was good. It was also deadly. CDC data shows that prescription drugs were responsible for what it calls the first wave of opioid deaths, which rose dramatically from the late 1990s until leveling off around 2010. Even before heroin and fentanyl deaths started to spike, the prescription opioid crisis was worse than the crack epidemic of the ‘80s. It has not gotten better. Pischke’s claim that “just 30 percent of opioid-related deaths in 2017 involved commonly prescribed pain pills” does not reflect prescription opioid abuse decreasing, but heroin and fentanyl usage getting worse—and the CDC still creditedprescription opioids with more deaths than heroin in 2017. As Caldwell put it, “Relaxed taboos and ready supply created a much wider appetite for opioids. Once that happened, heroin turned out to be very competitively priced.” Some users found heroin on their own as they chased a better high. Others turned to it when attempts to control the crisis of prescription opioids restricted their supply. The rise of fentanyl has been an even deadlier evolution of the crisis, as this super-potent synthetic opioid is mixed, often inexpertly, with other drugs. It is true that once heroin was reestablished as a normal part of the drug culture, some began using it without first abusing prescription opioids. Nonetheless, the current crisis arose from the over-prescription of OxyContin and similar drugs. 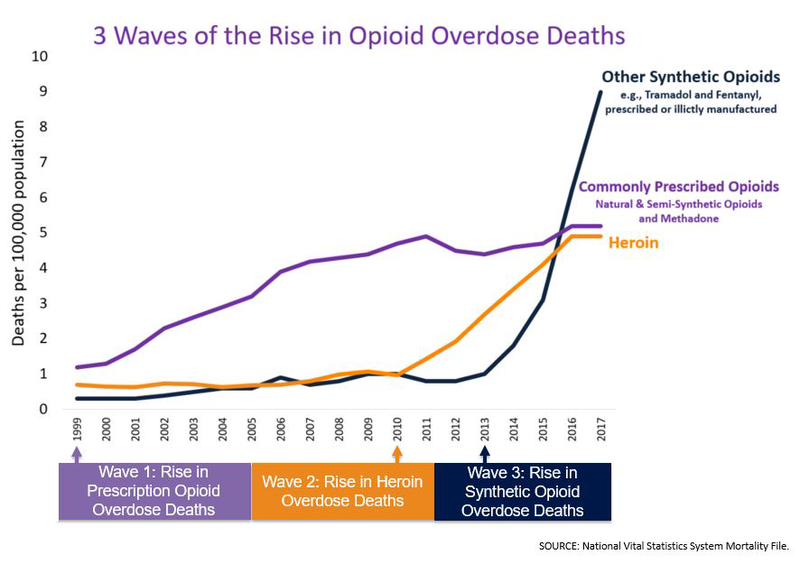 The conventional wisdom is correct to connect the epidemic of prescription opioid abuse with the crisis of street opioid overdoses. Readily available prescription opioids produced a crisis that will take many years to contain, and conservatives should not forget this lesson. In America today it is a rare person who does not have at least one friend or family member who either uses prescription opioids to manage pain or who abuses drugs, including opioids—sometimes these are all the same individual. We are not indifferent to those who are in pain, but we have learned from bitter experience that opioids must be carefully controlled. It is natural and right to sympathize with Pischke and others who suffer pain that prescription opioids can relieve. Their needs must be considered when crafting policy. However, those with a genuine need for prescription painkillers will not be helped by dismissing the role of pharmaceutical companies and prescription opioids in creating the current disaster of American addiction. Establishing a regulatory regime that protects patients while also reducing the risk of opioid abuse requires confronting the reality of what is happening, not ignoring it.